Source: Monument to Confederate Captains from Person County (1931), Roxboro. Photo courtesy of Tom Vincent of North Carolina Civil War Memorials. This rectangular stone marker with roughly-cut edges has inscribed on it the names of Confederate captains from Person county who lost their lives in the Civil War. 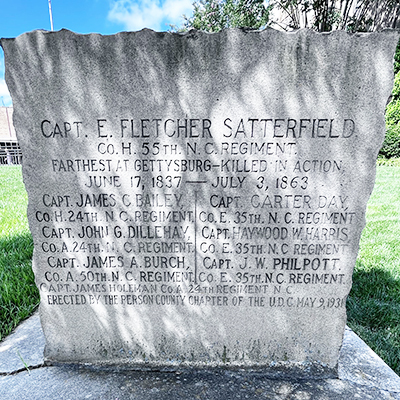 The monument commemorates Confederate leaders from Person County who were killed in battle, perhaps the most famous being Captain Edward Satterfield who went "the farthest at Gettysburg." The memorial is located on the courthouse square in downtown Roxboro, NC near the intersection of Main Street and Court Street just to the right of the Confederate Memorial and to the left of World War Two Memorial. Located on the other corner of the courthouse square (intersection of S Main Street and Abbitt Street) are Robert Lester Blackwell Memorial, Veterans Memorial and Korean War Memorial.